The National Weather Service says that the chance for any particular person to get hit is dependent on several factors, including the geographical location and personal lifestyle & hobbies. They say if we live and play where there is a lot of lightning, there is an increased chance of being struck or injured by lightning. Cold logic says that when we choose to go into the high peaks again and again, week after week, we multiply the risk by repeated exposure to an environment that is outside of the modern world’s safety infrastructure. We cannot expect to have a long life of adventure in the high peaks by just getting lucky, trip after trip, having close calls and minor incidents; but somehow living through it. The goal of the “yield and overcome” mindset is to push ahead when possible, but turn back satisfied when necessary. To make this happen, we need to know how to plan around lightning for maximum success and when, in the face of lightning hazards, to turn back. What risk level are we willing to assume? There is a continuum of reactions we each can take in the face of lightning danger. On the extreme conservative end, we could choose to never go outside when clouds are in the sky. On the extreme aggressive end, we could choose to never worry about lightning since it doesn’t seem to hit many people. The right strategy for most of us is between the two extremes, but it is up to each of us to select our own risk level. I would expect that our willingness to assume risk would also vary by situation, e.g., children coming along. How to plan to avoid lightning? There is no safe haven from lightning atop the high peaks; the only way to be very safe is to avoid lightning all together. Either we stay home on a bad weather day or we start early enough that we can get less exposed before the lightning shows up. How to read the sky for early warnings? Sometimes the weather is not predictable. Sometimes the lightning shows up when we are vulnerable, in spite our best plans. We can hear thunder 10 miles away or less; and since a air mass thunderstorm will travel over ground at 15-25 mph, we may have only 20-30 minutes before the storm is overhead (and the worst lightning risk begins). Hiking at 1-3 mph, depending on the terrain, is only going to allow us to get one-half to one and one-half miles down the trail. We need more lead-time; we need to be able to read the sky. 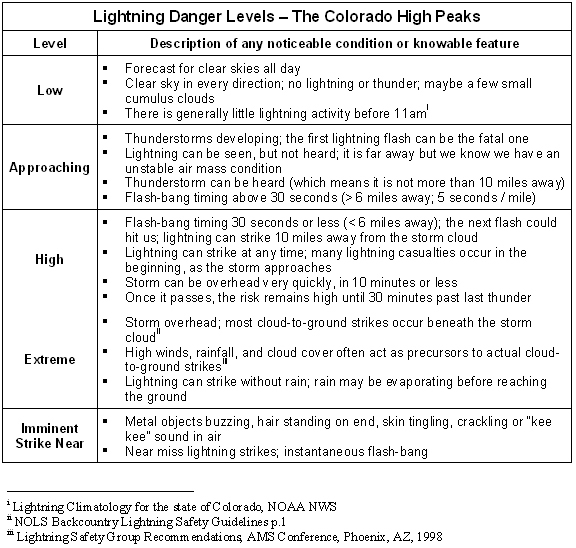 Our reactions to these levels of danger depend on our willingness to assume lightning risk. The chart below uses a “moderate” level of risk assumption for the advice provided by experts for minimizing lightning risks. This is an interpretation based on frequent expert statements denying “safety” while outdoors. 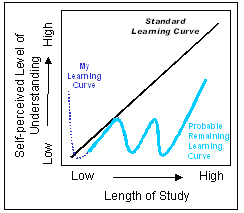 This is also the risk level I am willing to assume, and so I build my plans and behave on the mountain accordingly. The high-risk option is based on behaviors I have observed and even used years ago when first learning to play atop the high peaks. I include this level and the low-risk level to provide contrast. I recommend no one select a high-risk option, as it would be inconsistent with the “yield and overcome” mindset. This chart is intended to be a bit simplistic for now. After we review the remaining three questions: (1) planning to avoid lightning, (2) reading the sky, and (3) reducing the risk, I’ll add the findings to the chart for each risk assumption level. When on the mountain, we cannot change our location quickly to escape an incoming storm, so we need to avoid it by planning to be absent. We are absent by not going into the mountains on a bad weather day and by starting adventures early enough to get safe or safer before the lightning comes. The experts tend to agree that the best defense is to avoid lightning by starting early and turnaround by noon, which is also my own standard assumption, even though studies show that lightning in the high peaks typically begins to increase at 11am. So, sometimes noon is the right assumption, but sometimes it is wrong. We should check to know for ourselves. The decision that gives us the most control in avoiding lightning is the decision to stay home. But this is also the decision that keeps us from our beloved high peaks. We shouldn’t make this decision lightly, but make it we must. When the weather is good enough, we go; when the weather is bad enough, we stay home or pick something else to do. I am not a trained meteorologist nor do I hope to become one. So I like to think about the weather in simplistic terms: either we have normal weather or we have bad weather. 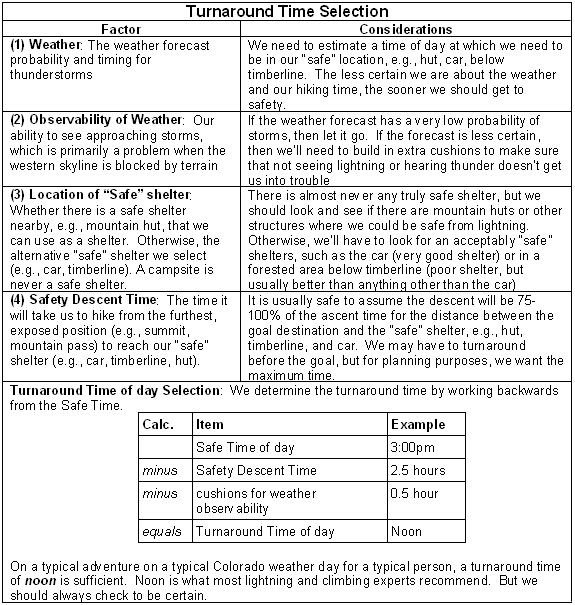 Normal Colorado late spring to late summer weather is generally good; it is sunny in the morning with increasing cloudiness and a low chance of thunderstorms in the afternoon. Bad weather is caused by some disruption (e.g., low pressure zone, cold front, monsoon) causing the weather to be bad all day or causing the weather to be less predictable than normal. I only venture into the high peaks on “normal” days and unusually great weather days, e.g., high-pressure zone over the mountains. The weather reports tell me what I need to make a decision. Note: “% Chance of Precipitation” means in x% of similar weather conditions, there would be precipitation somewhere in the forecast zone. This definition means the likelihood of precipitation on a particular spot is far below x%. The National Weather Service publishes watches, warnings and advisories that are in effect for Colorado. This information is available on the http://www.weather.gov website and via the NWR broadcasts. *Note: A well-located campsite is one chosen to be less likely to be hit or subject to lightning side flash or hit by falling branches or trees hit by lightning. Do not place your site in an open field, on the top of a hill, or on a ridge top. Keep your site away from tall isolated trees or any other tall isolated object. If trees surround you, place your campsite in a lower stand of trees. If you are camping in an “open” area, set up camp in a lower area, e.g., valley, ravine. Hazardous locations to avoid: high terrain (e.g., summits, ridges, tops of hills), open fields, lakes/ponds, rivers/creeks, conductive materials (e.g., railings, cables, fences), isolated trees. Do not hike or seek shelter too close to these locations. Indifferent locations: shallow caves, overhanging rocks, and depressions in the rock don’t offer much protection. It is better to keep going to a safer location unless the lightning threat warrants the “lightning crouch.” Getting wet should be the last of our concerns….get to timberline and then to the car. In general, we need to keep some attention on the sky and be prepared to abandon the adventure plan if the lightning risk seems to be increasing beyond our tolerance level. And since we cannot move quickly, we need to make decisions early. The ideal situation would be to divine the future from the clouds, wind, contrails or other clues to what the weather is going to do. But that is impossible. There are too many variables affecting the weather in the mountains that cause a thunderstorm to arise, and cause it to generate lightning that hits here, but not there. We cannot safely assume that we can venture into the high peaks on a bad weather day and “play it by ear” or assume that on the mountain we can wait to know for certain that it is a high-risk lightning day before retreating to avoid the high-risk situation. Once on the mountain, the only way to know for sure that the lightning is coming is to have the thunderstorm come overhead, but then it is too late for all but desperate measures. Still, there are some clues that occur between the early morning blue skies and the moment of hearing thunder that can help us. Predicting the weather is hard. Reading the sky might seem like it should be fairly simple; we all know what “normal” weather is like. But the problem isn’t the regular weather patterns; it is understanding and foreseeing the exceptions that can come from anywhere and out of nowhere. “The Weather” is a perfect example of an everyday subject that seems simple through casual, lifelong association but is revealed to be impossibly complex once we bother to look. Having gazed into the void myself, I will no longer be deluded into thinking I “know” what will happen based on clouds, winds, birds & bugs. The key for us non-weather experts is to limit ourselves to a narrow range of time and subject matter. For my own weather forecasting, I only try to see only a few hours into the future and only about lightning; I leave the rest to the experts. Where does lightning come from and what is it? Stated simply, lightning is a normal, everyday part of weather, and the sun causes the weather. The sun heats up the earth in an irregular fashion, in part due to the planet not being flat, part due to the rotation of the planet (constantly changing the part being heated), and part due to differences in what surface materials, e.g., water, rocks, grass, trees, the sun is trying to warm. The irregular heating results in temperature difference in the air (warmed by the land and water) and water around the globe. Since hot air rises and cold air sinks and because the planet is spinning, we get winds in the atmosphere. Since water evaporates from the oceans, lakes, rivers, and puddles, and from plant transpiration, we get water vapor in the atmosphere. Water vapor becomes precipitation in the mountains when the water-filled (humid) air rises. Air rises when it is warmer than the air above it or is pushed up by winds over the mountains. As the air & water vapor mixture rises and expands (due to lower air pressure), the air and water vapor cool; and if the water vapor cools enough, it will condense into water droplets. The water droplets (or ice crystals) form clouds, and if enough water condenses, the water droplets will grow large enough to fall back to the earth as rain, snow, hail, etc. Water in the sky is the beginning of lightning, but we need a thunderstorm to make some. Thunderstorms are a special type of cloud that requires a specific, but common type of instability in the atmosphere. In “normal” or “stable” air, warm air rises, and then it cools and sinks; clouds do not grow tall, but develop in thin layers or shallow puffs that can develop precipitation but not lightning. In unstable air, the warm, moist air continues to rise high into the atmosphere until the clouds are many times taller than stable air clouds, often up to 40,000-50,000 feet tall. In this wind machine powered by the latent heat in water vapor (much like a hurricane), the clouds grow tall enough to reach freezing temperatures. The rising warm air and sinking cool air push around the ice crystal and heavier chunks of ice, which bang into each other creating static electricity. The average charge of the cloud remains balanced, but the positively charged, lighter-weight ice crystals are held near the top of the cloud by the winds while the negatively charged, heavier icy clumps cluster at the bottom, also held up by the winds but just not as high up. The negatively charged cloud bottom causes electrons in the ground five thousand feet below to flee (like charges repel each other), resulting in a cluster of positive ions (electron “holes” or atoms seeking electrons) beneath the storm. This creates an electric field that can be heard, felt and smelled when strong enough. But as would be expected, most lightning is within the cloud. However, if and when the charge becomes strong enough to overcome the insulation of the air between the cloud and the ground, there is a cloud-to-ground lightning strike. When the thunderstorm winds collapse due to a loss of water vapor or the down drafts choking the updrafts, the separation of the positive and negatively charged ions is no longer possible. The potential for lightning ends. Basically, a cloud-to-ground lightning strike is a stream of many, many electrons running out of the cloud and into the positively charged ground that is seeking electrons. Occasionally, the positively charged top of the cloud interacts with the negatively charged ground away from the storm; this may be where the free electrons that were repelled from the storm went. This creates an electrical field that can result in “positive lightning” where the positive ions in the upper cloud create a tunnel of charged air that finds the ground and allows the electrons to run from the ground to the cloud. “Positive” lightning can seem to strike “out of the blue” miles away from a storm. So how to we tell if a thunderstorm may develop to threaten us? To answer this question, we breakdown the situation into three phases which can provide clues: (1) the unstable air conditions that allow thunderstorms to develop, (2) the early signs of thunderstorm development, & (3) late signs of thunderstorm development. In unstable air, warm air keeps rising. To be unstable, the lowest layers of the air mass must be unusually warm and/or humid, or the upper layers are unusually cool, or both. In unstable air, the lowest layers of an air mass are so warm and/or humid that when some of the air rises (after being heated or lifted over mountains by winds), it cools due to expansion but still remains warmer than its environment, and so it continues to rise (like a hot air balloon). If the rising air contains water vapor that condenses into droplets, a cloud is formed and latent heat is released that warms the air and make it rise further. This process can cause clouds to expand and become very tall. The most unstable air mass is one in which the lower layers are being heated strongly in a hot day and also contain a lot of water vapor (hot & humid), and the upper layers of air are cold. This permits the continuous rising of air and formation of clouds high into the atmosphere. This is the basis for thunderstorm formation. 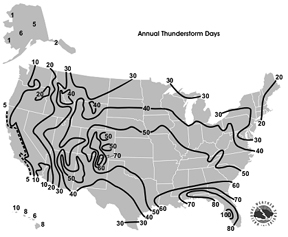 The more unstable the air mass, the more potential energy is available to fuel a thunderstorm. In the Colorado high peaks, an unstable air mass usually results from solar heating of the ground. There are other variables, e.g., cold front, low-pressure zone to the SE, that can create thunderstorms, but they will be picked up in the weather forecast. We just need to be able to foresee the development of a garden-variety or air mass thunderstorm. The type that only lasts an hour, doesn’t move quickly, nor produce severe weather. With our limited timeframe at stake, we just need to understand when there is enough humidity in the air and enough potential for difference in the temperature of the air layers above us to allow for thunderstorms. A lot of water in the air plus solar heating plus movement of warmed air up and over mountains equals thunderstorms; however, since there are many other variable we are not considering, let’s just say it could mean thunderstorms. Is the lower air layer humid? Is the temperature going to be hot? While hiking, we should keep our heads on a swivel, scanning the skies 360 degrees around and above us, not just to the west. Typically, we see the “fair weather cumulus” clouds form in the late morning. Most cumulus clouds look like light fluffy cotton balls and show the thermal uplift taking place. These clouds usually have flat bases and lumpy tops and are isolated with large areas of blue sky in between the clouds. The flat bottom is the level at which condensation begins, and its height will depend upon the humidity of the rising air. The more humid the air, the lower the cloud base. Cumulus clouds can generate rain, but not lightning unless they grow tall. When the atmosphere becomes unstable, the very strong, upward air currents can cause cumulus clouds to grow into cumulus congestus, which is much larger and taller with a the top that looks like the head of a cauliflower or into towering cumulus, which means a cumulus cloud has a tall shaft of cloud growing up out of its top. The key clue is that both of these new clouds are growing taller. When we see this, we know that the potential for thunderstorms exists. Once we see dark, towering, threatening clouds (called cumulonimbus clouds), we’ve missed the chance to notice early signs of thunderstorm risk. 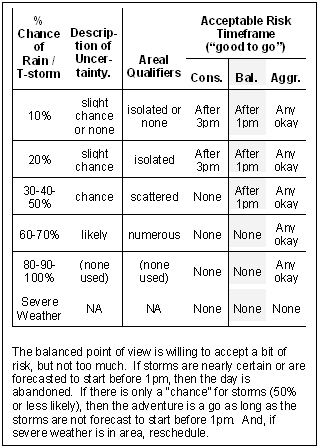 Thunderstorms can develop very quickly once the conditions are right. If we wait to find a late sign of thunderstorm development, we might have waited too long. If we see or “sense” a thunderstorm anywhere or in any way, the conditions exist for a thunderstorm to threaten us. We’ll be tempted to consider whether the storms will affect us or pass us by, but this is a mistake that may have serious consequences. A balanced perspective will always attempt to err on the side of reasonable caution. If you see late signs of thunderstorm development, it is time to go home, and quickly. Thunder, even without any visible lightning. A sudden cloudburst of enormous raindrops or hail of any size, even if it stops quickly. Once we hear the thunder or feel the cold wind or see the crashing hail, the thunderstorm is upon us. Our chance to avoid lightning is gone. Our chance to be safe is lost. We are now faced with looking for ways to reduce the risk that we can no longer avoid.